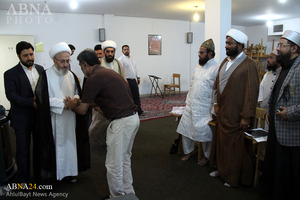 Tehran : "The cruel actions against Pakistani Shia Muslims cannot be tolerated. Occupying Shia territories by Pakistani government is unacceptable,"
In a statement on admonishing the recent cruel harassments towards Pakistani Shias, Grand Ayatollah Makarem Shirazi said, "I hope Pakistani Officials start taking serious measures in order to stop the cruel actions which are being carried out against Shias since they are posing a major threat to the unity of Muslim community,"
The revered source of emulation further said, "These days some sad and unpleasant news about recent incidents in Pakistan are being broadcasted in the media, Pakistani Shias are being harassed in different parts of the country, there have been some reports that the Police force raid Shia ceremonies and offend them. It's also been said that Government organizations and their affiliate institutions engage in occupying Shia territories,"
"This new anti-Shia movement in Pakistan has led to the hunger strike of so many Shias in the country, some of whom are in terrible health conditions. 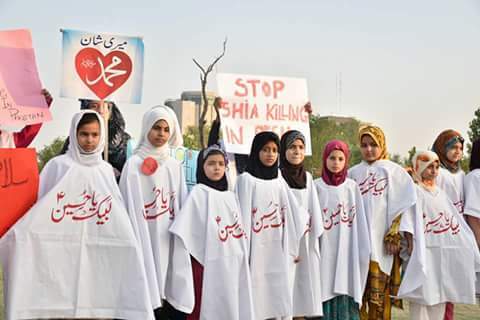 We're making efforts to establish and maintain the friendliest relations with Pakistani leaders as well as people, but such cruel actions against Shias in Pakistan which are backed by Takfiris and Wahhabis cannot be tolerated by Shias throughout the world, especially Iranian Shias," he added. 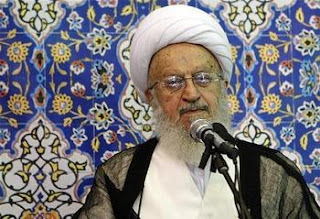 "We expect Pakistani leaders to do something in order to put an end to such irrational actions which are posing a major threat to Muslims' unity, also the world organizations must attend in solving this crisis and try to put an end to it," Ayatollah Shirazi added. 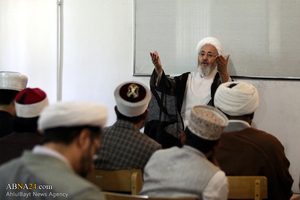 Senior Iranian jurisprudent has called Pakistani government to take measures against anti-Shia measures demanding Shia and Sunni communities to expand unity. Grand Ayatollah Hussein Noori Hamedani, prominent Shia jurisprudent, issued a statement urging Pakistani authorities and international bodies to put an end to recent incidents against Pakistani Shia community. 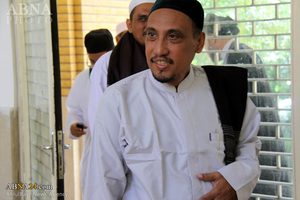 Top scholar in his message expressed regret over the unsatisfactory news from across the world of Islam that a group of oppressed people, from Shia community in Pakistan to the people in Palestinian lands, are harassed by colonial powers led by the US and Zionists. He referred to extension of jail term for prominent Bahraini cleric Shiekh Salman and the Shia community in Bahrain under the worst atrocities of their arrogant rulers, serving US objectives, a clear violation of human rights. The statement added,” On the other hand is the Takfiri (excommunication) and ISIL terrorists in Iraq and Syria are bringing irretrievable damages to image of Islam. 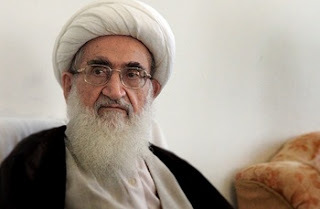 Grand Ayatollah Noori Hamedani in his message called Shia and Sunni communities to maintain unity warning against crimes committed in Iraq, Pakistan, Bahrain, Yemen, Syria and Palestine vowing that the era of oppression, injustice and inequality will soon end. 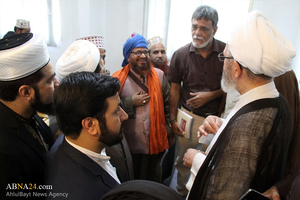 Iranian scholar also urged Pakistani authorities and international bodies to take immediate measures to put an end to recent incidents. 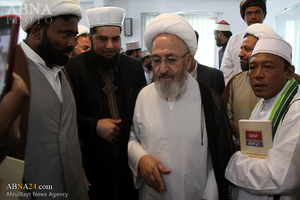 Top jurisprudent, grand Ayatollah Nasser Makarem Shirazi, in a separate message warned against harassment of Pakistani Shia demanding the government to take measures against hostile moves which might endanger Islamic unity. 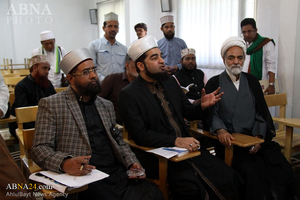 Top scholar called anti-Shia violence as unbearable calling Pakistani governments to take immediate measures to end the irrational moves which endanger Muslim unity. In a recent clash between a group of Shia and extremist Sunni Ahle Sunnat-Wal-Jamaat (ASWJ) in the Handhi area in Karachi, one Shia was killed and four others wounded. 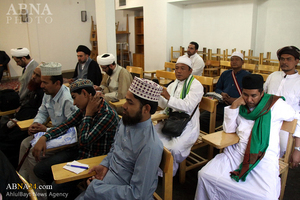 Secretary General of the AhlulBayt World Assembly, HojjatulIslam Akhtari, Grand Ayatollah Shobani and Grand Ayatollah Safi recieves Indonesian Sunni scholars at AhlulBayat World Assembly. 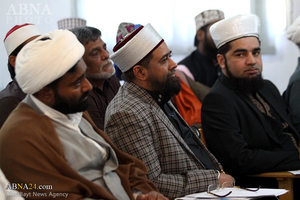 They are here to discuss many misinterpatations among Sunni and Shias. 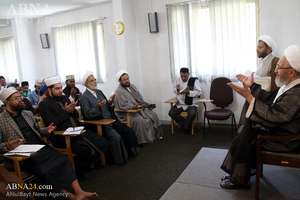 Grand Ayatollah Hussein Noori Hamedani, senior Shia jurisprudent, met with a group of scholars, politicians, managers of Islamic centers and also academicians from Pakistan highlighting importance of knowing the enemies calling religious leaders to rise against a government surrendered to the US.